Democratic congressmen who voted with Republicans on budget issues—and opposed healthcare reform—lost in primaries where populist economic messages won out. 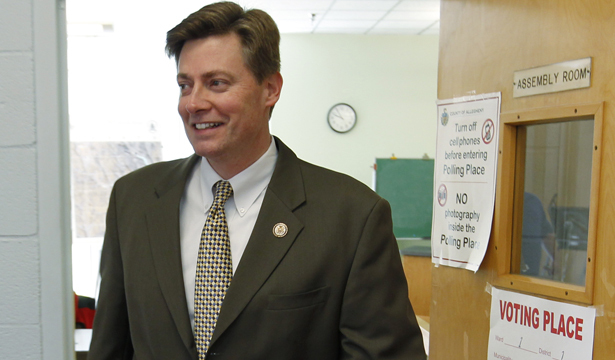 Two conservative Democratic congressman who aligned with Republicans during last year’s budget fights and broke to the right on a host of other issues were defeated in primary contests Tuesday in Pennsylvania. Congressmen Tim Holden and Jason Altmire, both members of the conservative “Blue Dog Coalition,” were swept out of office by Democratic primary voters who opted for candidates who were more clearly critical of corporate abuses and right-wing policies. One thing that distinguished Holden and Altmire was their support for the Republican balanced-budget amendment in 2011—a vote that put them at odds with the vast majority of Democrats in Congress. The GOP proposal sought to make deep cuts in Medicare funding and in support for education and healthcare initiatives. Altmire, a favorite of Fox hosts who claimed his fellow Democrats suffered setbacks in 2010 because “we were going further to the left than we should have,” lost in a race forced by redistricting with Congressman Mark Critz. Critz ran with the enthusiastic support of organized labor. United Steelworkers Union President Leo Gerard campaigned at Critz’s side across the new 12th district in western Pennsylvania, which included far more of Altmire’s old turf than Critz’s. Gerard argued that the district had been “gerrymandered in a way that would have given Jason Altmire an advantage,” and he bluntly explained that Republicans in the statehouse were protecting a friendly Democrat. “The reason they did that is, Jason had voted 53 percent of the time with the Republicans,” said the leader of the union that remains a powerful force in western Pennsylvania. Cartwright, in his race against Holden, was even more of a Roosevelt Democrat.